Congratulations to "Kai", the winner in Angi and Ann's giveaway. Thank you to all who participated! 12 SHADES OF MIDNIGHT has the full spectrum of writing styles. 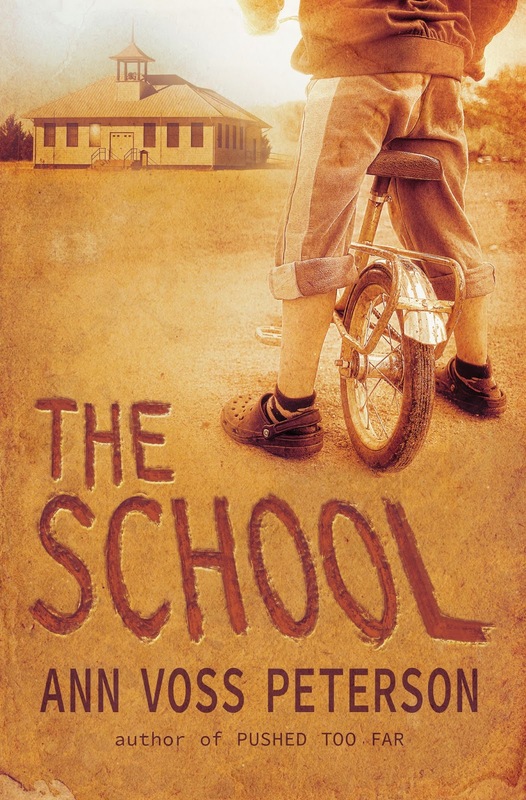 From Ann Voss Peterson’s thriller, THE SCHOOL…to Angi Morgan’s light-hearted paranormal, HIT & RUN HALLIE. 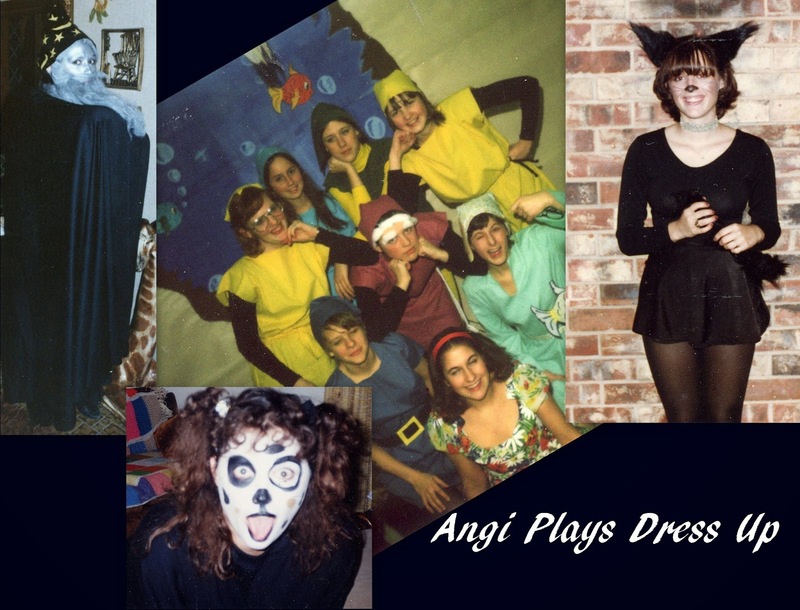 Ann’s ideas for Halloween costumes is also a little darker than Angi (who knows she’s appeared a bit goofy at times). This year Angi’s attending a Gotham City themed party. Out of the many possible Batman characters, all she wants to dress as…is a citizen. Ann would make a great Cat Woman. Ann: Cat Woman? Hell yeah! Or how about a little Trek? Ann (aka Yeoman Janice Rand, Star Ship Enterprise): When I was a kid, I loved dressing up for Halloween, and my parents enjoyed helping me make creative costumes (okay, they actually made most of the costumes, but…). I was everything from the Tin Woodman in Wizard of Oz to a Green Bay Packer football card to The Headless Horseman. 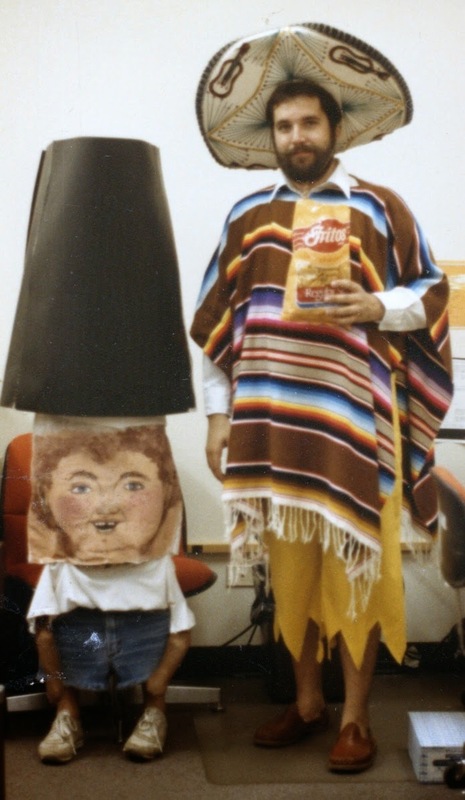 Since my hometown of Madison, Wisconsin has a huge Halloween bash on State Street, I continued the dress up tradition far into my grown up years. It was too fun to give up. My friends and I dressed as the villains in the Beatles’ Yellow Submarine one year (we had two Blue Meanies, a Bonker, and a Snapping Turk), anti-war protestors from the 60s (hey, it was Madison, WI! 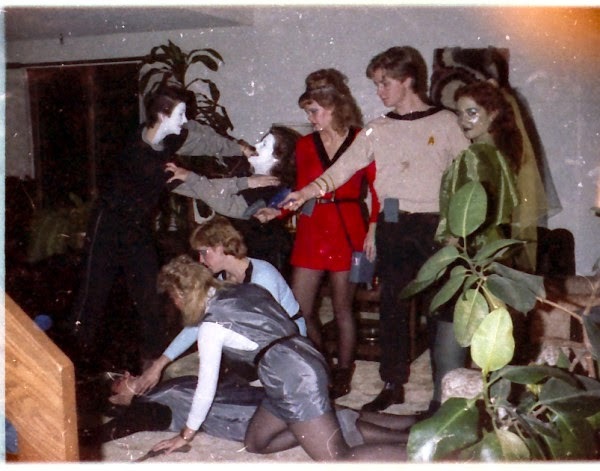 ), and of course, my favorite costume (above), the Star Trek crew! 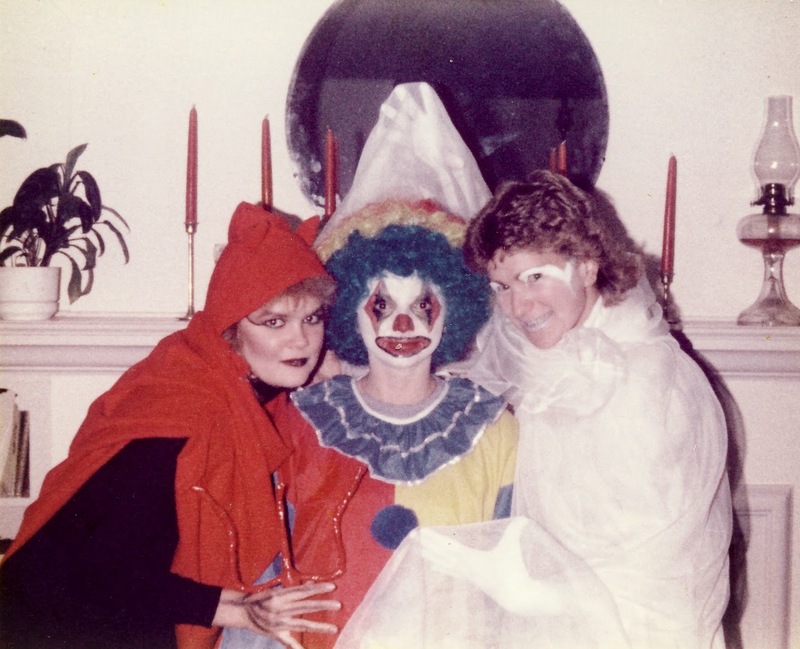 And here’s a little taste of the dark side of Halloween; the devil, the clown, and the ghost. I’m Satan, but the scariest costume here is the clown, I swear. Clowns… shudder. Angi: My new series is completely opposite, Ann. The scariest thing that happens to my bodyguards is that one might break a heel. 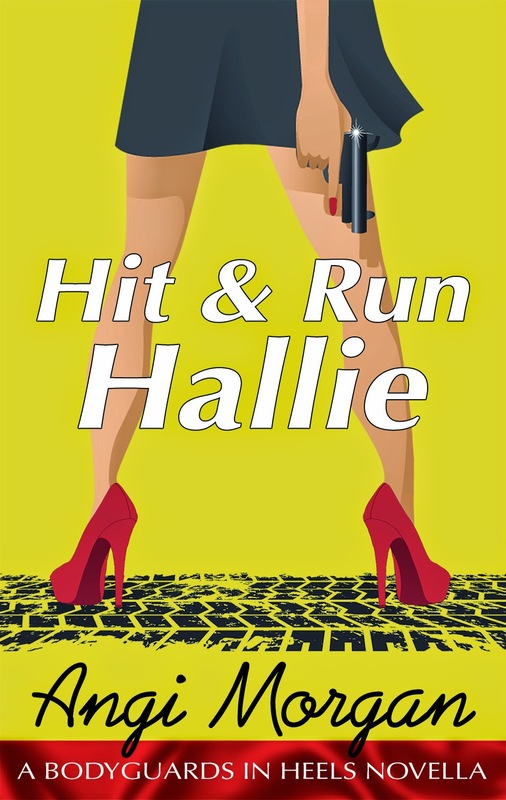  In fact, HIT & RUN HALLIE is the introduction to my new series of novellas, BODYGUARDS IN HEELS. My heroine dresses nice and considers it her armor, even if it is four inch stilettoes. I’ve always loved to dress up for Halloween. My tastes keep me on the lighter side though. I’m not a big gore or slasher gal. So I’ve had lots of fun. Grumpy with seven of my friends who completed the Snow White and 7 Dwarfs. A “cat-tail” waitress…actually waitressing at Pizza Hut. A clown--I’m not sure how many times. A dog (seriously) the year my daughter was in love with 101 Dalmations. A wizard--covered in silver makeup that I washed off for a week. And a rather wacky pillow character that has no name. He was even in a show… Readers can watch him on YouTube. Thanks for hosting us Maureen. We’ve had great fun this week on Just Romantic Suspense and hope you’ll catch all the posts from our anthology co-writers. ANN VOSS PETERSON is the bestselling author of over thirty novels and has millions of books in print all over the globe. Winner of the prestigious Daphne du Maurier Award and a RITA finalist, Ann is known for her adrenaline-fueled thrillers and romantic suspense novels, including the Codename: Chandler spy thrillers she writes with J.A. Konrath and her own thriller series featuring small town Wisconsin police chief Val Ryker. Angi’s giving away a copy of the 12 Shades Anthology to a blog commenter. WHAT’S YOUR FAVORITE COSTUME? Leave your opinion for a chance to win. LEAVE A BLOG COMMENT and enter the 12-Shades week-long RAFFLECOPTER drawing. Lots of ways to enter. Lots to give away. Giveaway ends 11:59pm EST October 31st. Please supply your email in the post. You may use spaces or full text for security. (ex. jsmith at gmail dot com) If you do not wish to supply your email, or have trouble posting, please email maureen@justromanticsuspense.com with a subject title of JRS GIVEAWAY to be entered in the current giveaway. Thanks for having us Maureen. I hope everyone clicks through to the rafflecopter and monthly contests. Lots of good prizes to give away. What was your favorite costume! If you have a picture posted somewhere...I'd really like to take a look. My fav costume I wore was this pink and black sorceress costume I had... loved it... have not dressed up in years... on occasion I paint things on my face... One year I painted Mushu the dragon on my cheek... took pics but they came out outta focus. Happy Halloween All! I'm horrible at painting anything. My husband would argue that I can't paint a room either ! My 15-year-old son wants to see a band that's playing at Mad Freakfest (Madison, WI's Halloween Party on State Street), so we're going to head down there. I'm trying to come up with a costume! This year,Elfaba (Elfie) costume is my favorite. I just love being green and dressing in black with the pointed hat. Hope you enjoyed Halloween, Kai. Sounds elaborate and fun, Brenda ! I love the green witch in WICKED !! My little pony :) I think that I was able 6? Thanks for sharing! My neighbor was a zombie at work....and rode the commuter train... Lots of stares and lots of pictures. She's always good at it. If we celebrated Halloween here I think I would make a great witch. Awe Mary...you guys should petition ! Or just have a costume party in October!! My favorite costume is one I saw on the Internet this year. A fellow was dressed as 50 shades of grey by attaching 50 grey paint chips to himself. I thought it was a fantastic idea and looked pretty good too. My favorite costume was when I dressed up as Bucky Dent from the Mets. I was about 13 ,but I had the biggest crush on Bucky. Hahaha! Now, that's MY kind of costume. random.org chose your comment to win a copy of 12 SHADES OF MIDNIGHT ! !